Biodiversity simply means "diversity of life". Behind this is the task of preserving our ecosystem as well as the most diverse types of creatures and genes. So, to preserve the diversity in nature, several factors speak in favor of the vegetarian diet. Bison, antelope and other animals that rely on pasture areas are increasingly being displaced by herds of cattle. For the herds of cattle uniform pastures are created (grass monocultures), which lack the natural diversity of the plant world. The cattle themselves have a destructive effect on the soil. In contrast to antelope, they have to go to the water points every day and thus compress the soil due to their heavier weight. The feces of antelopes is compact and spherical. The nitrogen is held in it and thus fertilizes the soil sustainably. Cattle, on the other hand, have a very moist feces that spreads flat on the ground, allowing the heat to evaporate most of the nitrogen. This produces ammonia, which also pollutes the atmosphere. This deprives the soil of a valuable nutrient and enriches the atmosphere with ammonia, which later falls to earth as acid rain somewhere else. In Central America, over the past 40 years, 40 percent of the total rainforest has been cleared or burned, mainly to conserve pasture or grow feed. In addition, fisheries in the oceans have been forced so much that here too the borders are reached and fish stocks can no longer recover. Animal farming produces an enormous amount of manure, which is then dumped in the meadows. Permanent fertilization with faeces and the increased nitrogen content in the soil kill many microorganisms, which reduces soil fertility. As a result, the biodiversity of flora and fauna is increasingly reduced. "According to some experts disappear up to 35,000 species annually from the earth. "1 Other causes of this problem are the use of more and more poisons (herbicides, pesticides, fungicides) in agriculture. For ten years, the food industry has been all about fish. Global consumption levels are constantly increasing. In Switzerland, the increase from 2001 to 2005 was 15%, worldwide the consumption has increased sixfold since 1950.2 This, of course, has a huge impact on the fish stock itself, but also on the whole ecosystem. Stocks of predatory species, such as tuna or swordfish, have shrunk by 90%, in contrast to the period when non-industrial fishing has taken place. Without their natural predators it will be easy for pests such as jellyfish to multiply unhindered and destroy the ecological balance of the oceans. What is slowly emerging in the fish, has long been a reality for livestock on land. For economic reasons, especially the livestock breeds are bred, with whom earns the most. Through this deliberate displacement of the original breeds by the few livestock breeds automatically reduces the biodiversity. The problem is also compounded by the cutting down of rainforests. The rainforests are home to an estimated 80% of all animal and plant species living on Earth. "The jungle is really eaten by the cattle," says Tobias Riedl, forest expert from Greenpeace. "This madness must be stopped immediately, otherwise it has catastrophic consequences for the global climate and the preservation of biodiversity." The usefulness of small bees to humans is only noticeable since the topic of bee mortality has appeared in the media. 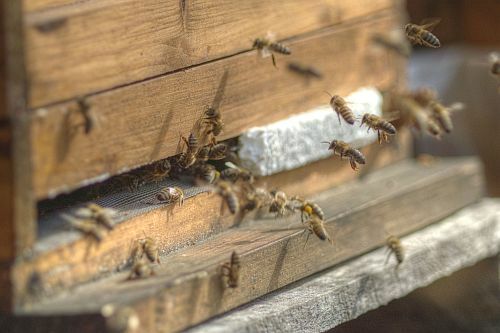 The rapid decline of more and more bee colonies shows probably the clearest, where the reduction of biodiversity leads. Again, the breeders have specialized in the most profitable bee species and bred about 20 subspecies of this honey bee and spread. The worldwide genetically almost identical honeybee of beekeepers now displaces the other pollinating insects of nature, which bring no direct profit to humans. The consequences have been visible for some time: One bee species is rapidly displacing all other species. This results in a genetic impoverishment. There are more and more diseases among bee colonies that spread epidemic-like. The disease resistance of the bee stems decreases more and more. More on this: Honey. As mentioned above, specializing in certain profitable farm animals ensures that wild animal species die out more and more. This fact is further promoted by genetic engineering. For here, too, plants are deliberately manipulated in such a way that they are more resistant to the poisons distributed by the manufacturers than their natural counterparts. This is particularly evident in fodder plants such as soy and rice, which are mainly affected by the manipulation. Original species, which are not up to the recommended poisons of genetic engineering manufacturers, are gradually supplanted by the genetically engineered plants. This ensures that natural species disappear from the earth and that farmers depend on the GM-cultivated seeds of the producers. In this way, an ecosystem is created that consists only of monocultures. Species protection or animal welfare? In the name of biodiversity, it is particularly important to point out that the diversity of life can not involve killing other sentient beings. Nevertheless, it does not seem easy to find unity in this diversity. Not for nothing there is the division into so-called animal welfare and species protection organizations. While biodiversity deals exclusively with endangered species, animal welfare organizations are primarily concerned with the welfare of pets. Where the farm animals are hardly protected by anyone, but - as the name implies - only paid attention to how they can be better used. Just the subdivision into these different groups shows that society has probably defined for itself what is protective and lovable. Vegetarians are convinced that our compassion for other living things can not be reduced to certain types. For the task of man is to care for all animals well and responsibly. Vegetarianism is therefore the clearest sign of biodiversity exploitation and waste of biodiversity. By consciously deciding which foods are good for ourselves and our environment, vegetarians probably make the most important contribution to the preservation of life. Organization portraits: What animal, environmental and wildlife conservation organizations really do for vegetarianism.